Jorge Trejo López, Director of Operations at Chinoin, recounts the installation of Roto Cube, IMA Active’s Single Pot Processor, in their plant in Mexico. Think global, act local: this is the biggest strength of Chinoin, one of the most important pharmaceutical companies in Mexico. Through its ninety years of history, the company is committed in the development, manufacture and commercialization of medicines with proven quality, efficacy and safety for human and animal health. Today, thanks to the professionalism of its people, Chinoin occupies a leadership position both in formulation and in sales of pharmaceuticals. «We are a company where valuable people find the opportunity to develop», states Jorge Trejo López, Director of Operations at Chinoin. «This has led to constitute an experienced, mature team committed to product quality. The medical staff, nurses, pharmacists, distributors and final consumers find in our products a therapeutic action adapted to their needs». The success in expanding the product range has widened Chinoin’s prestige beyond the Mexican borders. In fact, while sustaining the economic and social well-being in Mexico, Chinoin exports its products to Central America, South America and the Caribbean. The facilities in Aguascalientes have been built following the best international practices, aiming to maximize product capacity and quality control. Equipped with top-level technologies, the pharmaceutical plant produces Solids and Semi-Solids, Liquids and Injectables, and is the location where a Roto Cube, IMA Active’s Single Pot Processor, was installed. What are your requirements for the new Single Pot Processor? Which are the criticalities of the product manufacturing? We were looking for granulation equipment suitable for working batches up to 60 kg in a small room. The market offered us three solutions. As a first option, the line was composed of a High Shear Mixer and a Fluid Bed Processor: this solution would have ensured high efficiency, but was too bulky for our room. As a second option, Continuous Manufacturing technologies available on the market would have been suitable mostly for processing big volumes of a single API. That is why we finally chose a Single Pot Processor: granulation and drying in one single, compact piece of equipment. What is your main reason for choosing Roto Cube? 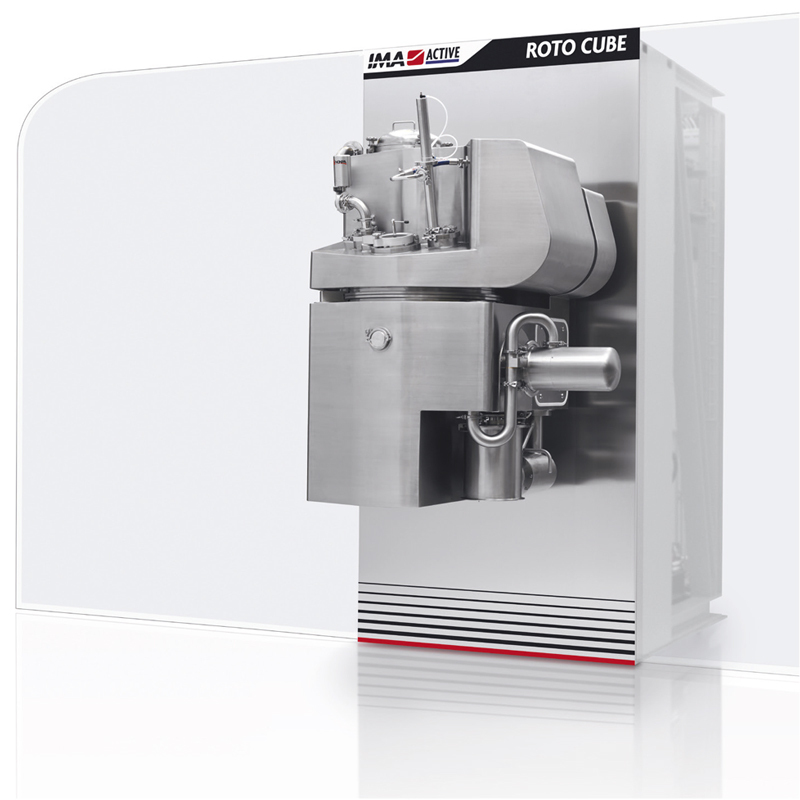 Roto Cube technology is the benchmark for single pot processing. Roto Cube allows the entire process of any type of product, from the loading of raw materials to the discharge of dry granules, carried out in a single, contained bowl, thus eliminating the contact between product, operator and the environment. In addition, Roto Cube allows us to count on IMA’s support in process optimization. Our collaboration with IMA Process Technologists allows us to maximize the quality of the final product. How is the collaboration with IMA? Nothing new from this project with IMA: as always, the quality we need in the time we need. The availability of a complete line to serve the pharma industry, from processing to packaging, combined with the reasonable price of the equipment are the main reasons why we continue to choose IMA through the years. Our collaboration is solid and lasting. Every time, we have appreciated IMA’s positive attitude: both the technical team and their management showed competence and experience. We have recently carried out the Facility Acceptance Test for an Atlantis, IMA Active’s washing station designed to wash and dry, in a completely automatic system, containers and other components used within the pharmaceutical industry. For the future, we are interested in an Adapta 200, IMA’s top-level technology for capsule filling, and a Prexima 300, IMA Active’s tablet press for medium production output. We will open a new facility in three years and IMA will be our trusted partner.